Last Thursday, an open letter was published in the FT demanding more fiscal spending in the euro zone (also available here). I agree with the authors that quantitative easing is not the way to go (there are six pages on QE in my new book which is written in German), and I would have stressed that beggar-thy-neighbor policies as those that are in place now should be abandoned because they can’t work for the global economy as a whole. However, I agree with the conclusion: fiscal stimulus. At this moment, it is absolutely necessary to let government spending grow. As I have shown yesterday, Iceland’s success story of returning to positive growth after only three years of crisis has not been reached by austerity, but by letting government spending rise again. The same goes for Germany, which has been growing relatively well. 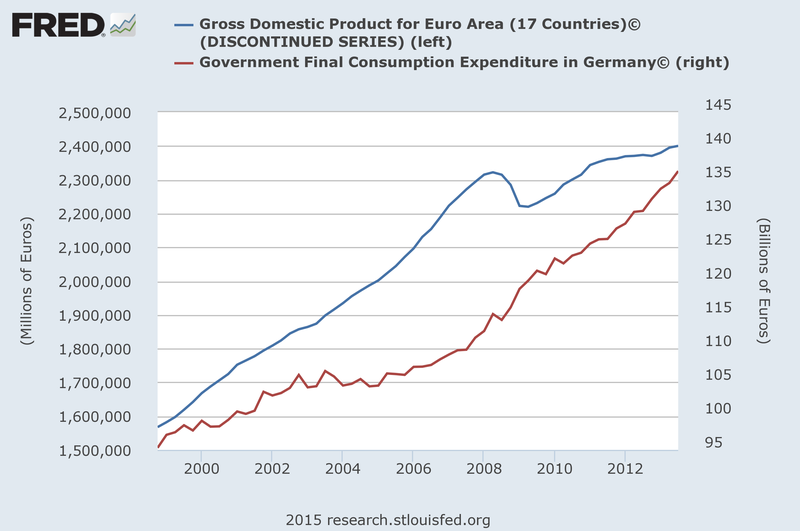 Government spending has gone up, not down: What we need in the euro zone is more aggregate demand. That additional demand means that someone must move into debt, because that someone will spend more than she has as an income. Traditionally, this is the role of government. Remember IS/LM? If expenditure is too low, spending has to go up. There is monetary policy, but when investment is interest-inelastic then a fall in the interest rate will not make investment go up. This is the problem that we seem to have in the euro zone rather than some kind of liquidity trap. Having lowered the interest rate all the way to zero, and having the ECB increasing reserves which banks hold as deposits at the central bank did have the desired effect on the economy. Why this is so can be examined later (although I have some ideas), but policy should react to this empirical problem by pulling the other lever: fiscal policy. The problem is: the euro zone has been constructed so that there is no spender-of-last-resort. The ECB is not allowed to directly finance governments, and hence all government can go bankrupt. Even the German government bonds are not risk-free. It is time to rethink the fiscal-monetary nexus of the euro zone.